China's film authorities have denied a release to Disney's new Winnie the Pooh film, Christopher Robin, it's reported. No reason has been given for the decision, but it's believed to be part of a nationwide clampdown on references to the beloved children's character. Chinese authorities have been blocking images of Pooh on social media since last year, after the AA Milne bear became a symbol of political dissent. It's after the Chinese leader Xi Jinping has been compared to the bear. 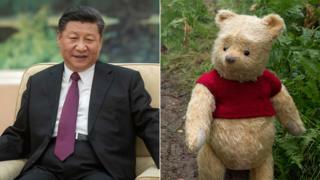 The comparisons began in 2013 when an image of Xi walking with President Barack Obama was posted alongside a picture of Pooh walking next to Tigger. Then in 2014, a picture of Xi shaking hands with Japanese Prime Minister Shinzo Abe was shared along with a picture of Pooh with Eeyore. As the memes grew popularity, Chinese censors began blocking images, GIFs and mentions of the bear across social media. In 2015, a picture showing Xi in a motorcade alongside an image of a Winnie the Pooh in a toy car was called "China's most censored photo" by political analysis company Global Risk Insights. And in June, China censored comedian John Oliver and HBO's website after the British talkshow host ran a segment on his US show, Last Week Tonight, criticising Xi and China. In the roast, he also mentioned the President's sensitivity to being compared to the bear. Global Risk Insights suggests the censorship of Pooh bear may be taking place because the comparisons with the President are seen by Beijing as "a serious effort to undermine the dignity of the presidential office and Xi himself". The Hollywood Reporter notes, however, that China has an annual foreign film quota - currently set at 34 - and that the Chinese market is likely to be more interested in different films. Disney's A Wrinkle in Time was also denied a release in China earlier this year but Skyscraper, Mission Impossible: Fallout, and Ant-Man and The Wasp are among Disney's offerings to open in the country. Christopher Robin is a live action film starring Ewan McGregor as the leading role and tells the story of Robin reuniting with the honey-loving bear as an adult and rediscovering his playful imagination.